Tajikistan’s government is set to spend more than 30 billion somoni (more than $3.8 billion) for the implementation of large energy projects to achieve energy independence, ca-news.org reported on September 15. According to relevant agencies of the economic bloc, the energy sector remains the prior development dimension and the financing of the given sector is prior too. The state budget provides big funds for the development of the energy sector, and the hydro power generation, first. In addition, foreign investments, loans and grants are being raised. For instance, during the last 15 years, 32 energy projects for 12 billion somoni (more than $1.5 billion) have been implemented in the country. At present, the country implements such big projects as construction of a thermal power plant, hydropower plant and power transmission lines. In May 2016, CASA-1000 regional project of power transmission lines was launched. The power lines will run 252km in the territory of Tajikistan. The given part of the project will cost $314 million. The idea of CASA-1000 project emerged 10 years ago. Then, there was certain surplus electric power generation in Kyrgyzstan and Tajikistan. In addition, Bishkek and Dushanbe weighed construction of large HPPs - Kambarata HPP in Kyrgyzstan and Rogun HPP in Tajikistan. The situation has changed since, as Kambarata and Rogun have not been built and it is not known if they will be ever built, while the surplus electric power has turned into deficit of energy in autumn and winter seasons in Kyrgyzstan and Tajikistan due to worn-out power distribution networks and poor management in the field. In addition, the Asian Development Bank, nearly the key lobbyist of CASA-1000, has refused to fund the project. 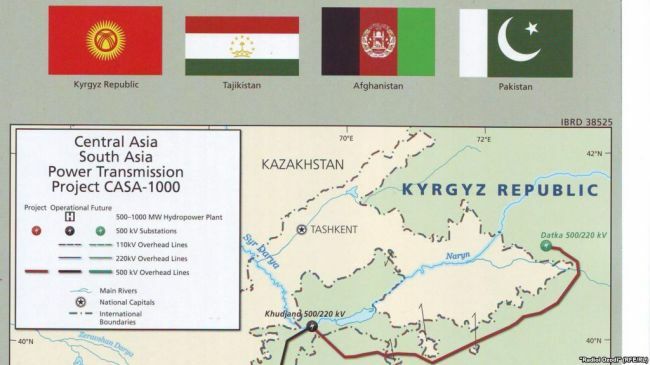 It is not clear who will be consuming the Tajik electricity, as Afghanistan, one of the project members, earlier said it would not be supplied electric power through CASA-1000 project; it will be just transiting it to Pakistan. It is not known yet how much electric power Islamabad will be importing.